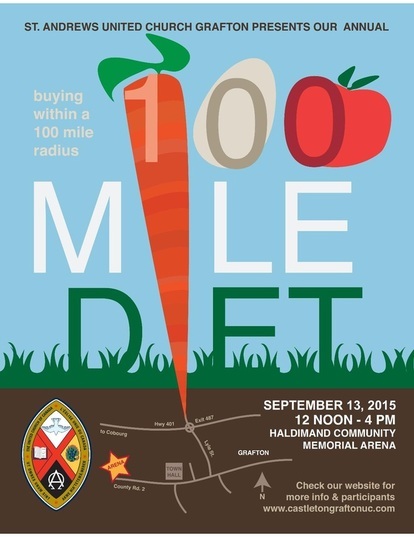 St. Andrew's United Church, Grafton is hosting our 9th 100-Mile Diet Event on September 11th from 12 to 4 p.m. at Grafton Arena located at 10766 County Rd 2. Our Mission Statement for this event is: “To encourage & showcase local products produced on the land & to live with respect in creation”. using the food available that day gives you a chance to learn new recipes and techniques. Chef Steve Benns, Culinary Coordinator, Chef/Professor at Fleming College has been our chef demonstrator since our inception. Adam Hudson is returning as a chef demonstrator. DONATIONS will be accepted at the door to support Northumberland Food For Thought School Nutrition Programmes. Apples were purchased with the $1,164.75 in donations last year. Thank you to all who contributed to this worthwhile programme.